Monogrammed Makeup Bag. Graduation Gift. Personalized Canvas Cosmetic Bag. Bridesmaids Gifts. Wedding Emergency . Zipper Pouch. Travel Gift. Monogrammed Train Case. Travel Toiletry & Cosmetic Bag. Personalized Bridesmaid Gift. Graduation Gift. Personalized Gifts. Personalized Jewelry Case. Monogrammed Round Travel Case. Bridesmaid Gift. Graduation Gift. Black Herringbone. Monogrammed Tote Bag. Graduation Gifts. Bridesmaids Gifts. Personalized Canvas Boat Tote Beach Bag. Zipper Carry On Bag. 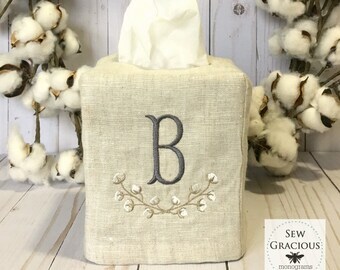 Monogram Linen Tissue Box Cover. Nola Font. Powder Room. Guest Room. Bathroom Decor. Wedding Gift. Hostess Gift. Personalized Boutique Gift. 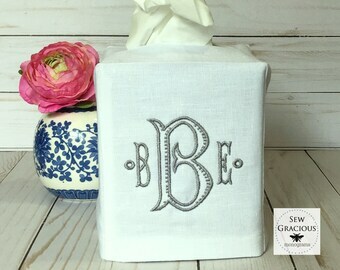 Monogrammed Linen Tissue Box Cover. Baby Nursery Kleenex Box Cover. Wedding Gift. Hostess Gift. Personalized Gift. 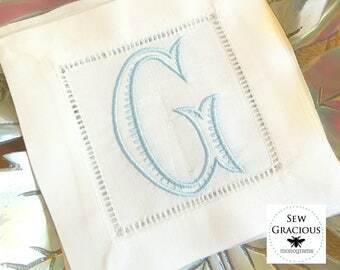 Monogrammed Cocktail Napkins. Set of 4. Bee & Crown. Wedding Gift. Mothers Day. House Warming Gift. 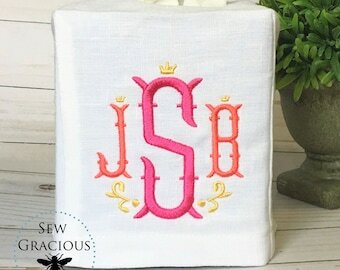 Monogrammed Guest Towel. Personalized Gifts. Chinoiserie Pagoda. Hostess Gift. Wedding Gift. Housewarming. Monogrammed Gift. Linen Guest Towel. Powder Room Decor. Bar Cart. Hostess Gift. Wedding Gift. Personalized Gifts. Monogram Pillow Cover made to fit a 12x16 insert. Wedding Gift. Baby Gift. Graduation Gift. Dorm Decor. 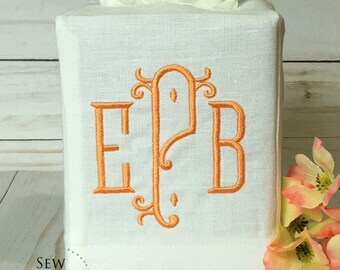 Monogrammed Tissue Box Cover. Kleenex Box Cover. Powder Room Guest Room Bathroom Decor. Wedding Gift. Hostess Gift. Mothers Day Gift. Monogrammed Gift. Linen Tissue Box Cover. Personalized Gift. Powder Room. Guest Room. Wedding Gift. Hostess Gift. Decorative Monogram Pillow Cover. Personalized. Made to fit an 18x18 Throw Pillow. Wedding Gift. 2nd Anniversary Gift. Embroidered. 4 Letter Monogram Pillow Cover. Personalized Gift. Wedding Gift. Graduation Gift. Fits an 18x18 Pillow Insert. 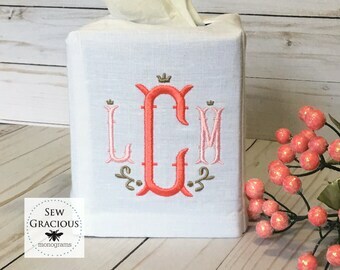 Monogrammed Tissue Box Cover. Powder Room. Guest Room. Bathroom Decor. Wedding Gift. Hostess Gift. Personalized Gifts. 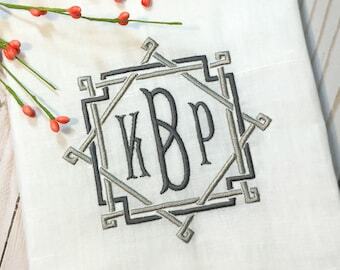 Monogram Pillow Cover. Personalized Gift. Made to fit an 18x18 Throw Pillow. Wedding Gift. Dorm Decor. White Pillow. Monogram Pillow Cover made to fit a 12x16 pillow. Baby Gift. Nursery Decor. Dorm Decor Personalized Gift. 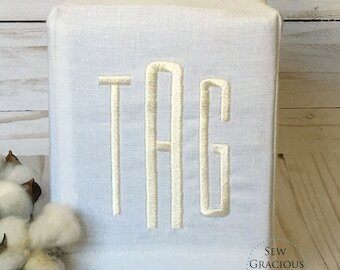 Monogrammed Linen Tissue Box Cover. Personalized Gift. Arabesque font. Powder Room. Guest Room. Wedding Gift. Hostess Gift. 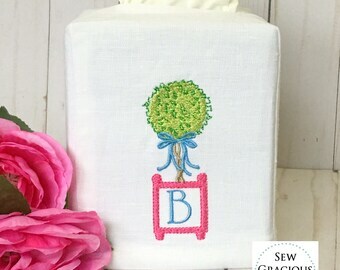 Monogrammed Linen Tissue Box Cover. Baby Nursery Kleenex Box Cover. 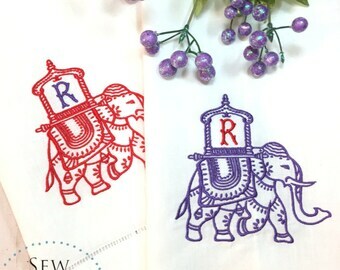 Embroidered Wedding Gift. Hostess Gift. Personalized Gift. Monogrammed Gift Pillow Cover. Personalized Made to fit an 18x18 Throw Pillow. Wedding Gift. 2nd Anniversary Gift. Embroidered. Pagoda Chinoiserie Monogram Pillow Cover. Made to fit a 12x16 Decorative Pillow. Wedding Gift. Baby Gift. Blue & White Home Decor. 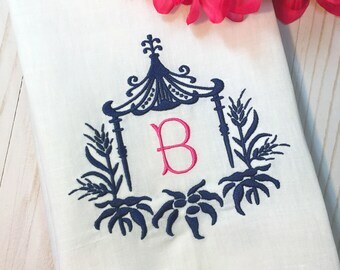 Monogram Initial Linen Guest Towel. Chinoiserie Decor. Hemstitch Powder Room Towel. Bar Cart. Hostess Gift. 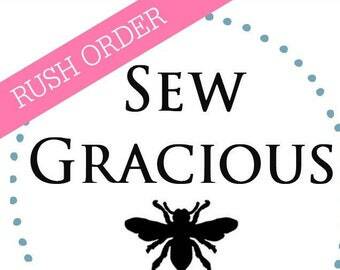 Sew Gracious. White Tea Towel. 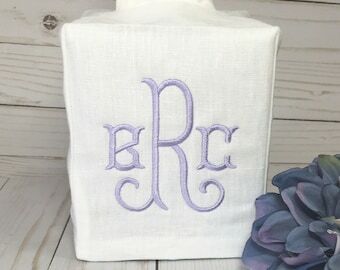 Monogrammed Tissue Box Cover. Kleenex Box Cover. Linen Powder Room. Guest Room. Bathroom Decor. Wedding Gift. Hostess Gift. 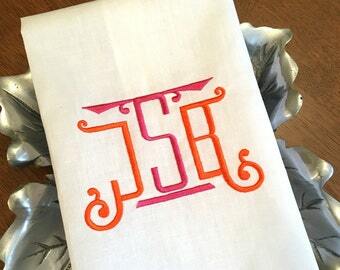 MONOGRAMMED Cocktail Napkins. Wedding Gift. Personalized Gift. Chinoiserie BAROQUE Font. Housewarming Hostess Gift. Bar Cart Decor. Monogrammed Pillow Cover to fit an 18 x 18 Throw Pillow. Wedding Gift. Graduation Gift. Personalized Gifts. 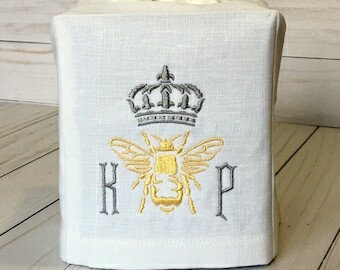 Queen Bee Monogrammed Linen Tissue Box Cover. Crown & Honey Bee Decor. Powder Room. Wedding Gift. Hostess Gift. Personalized Gifts. Grad Gift Dorm Decor. Embroidered NUMBER Pillow Cover. Area Code. House Number. Zip Code. To fit an 18 x18 Throw Pillow. First Home Gift. Pagoda Monogram Pillow Cover to fit a 12x16 Decorative Throw Pillow. Chinoiserie Asian Temple Embroidery. Personalized Gift. Personalized Gift. Monogram Pillow Cover made to fit an 18 x 18 Decorative Throw Pillow. Baroque font. Wedding Gift. Graduation Gift. Chinoiserie Monogram Pillow Cover. 18 x 18 Decorative Throw Pillow. Baroque font. Embroidered Linens. Wedding Gift. Graduation Gift. Nola font Custom Monogram Pillow Cover made to fit a 12x16 Decorative Throw Pillow. Baby Gift. Nursery Decor. Wedding. Personalized Gift. 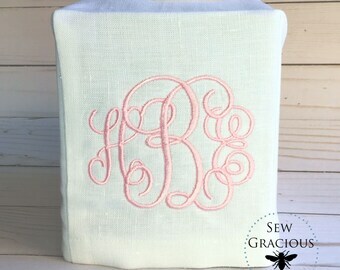 Monogrammed Linen Tissue Box Cover. Powder Room. Guest Room. Bathroom Decor. Wedding Gift. Hostess Gift. Personalized Boutique Gift. Chinoiserie Monogram Linen Guest Towel. Hemstitch Powder Room Towel. White Tea Towel. Bar Cart Decor. Elegant Embroidered Linens. Chinoiserie MONOGRAM Cocktail Napkins with 2 color embroidery. Hostess Gift. Summer Wedding Gift. Personalized Gifts. Pagoda font Chinoiserie Monogram Pillow Cover to fit a 12x16 Decorative Throw Pillow. Wedding Gift. Dorm Decor. Bedroom. Nursery Decor. Monogrammed Pillow Cover. Dorm Decor. Nursery Decor. Baby Gift. Wedding Gift. Made to fit a 12x16 Decorative Throw Pillow. Wedding Gift. Je t'aime Love Monogram Pillow Cover made to fit a 12 x 16 Decorative Throw Pillow. French Foreign Language. Monogrammed Pillow Cover made to fit 12 x 16 Decorative Pillow. Personalized Gifts. Dorm Decor. Graduation Gift. Monogram Pillow Cover made to fit 18x18 Throw Pillow. Bedroom Decor. Wedding Gift. Personalized Gift. Embroidered Decorative Pillow. 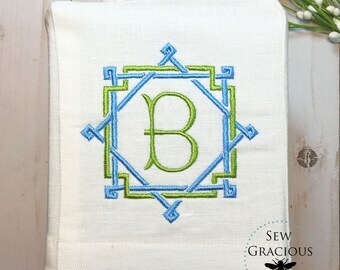 Embroidered Monogram Pillow Cover Made to fit a 12x16 Decorative Throw Pillow Insert. Baby Gift. Nursery Decor. Dorm Decor. Wedding Gift. Chinoiserie Monkey with Parasol Embroidered Cocktail Napkins. Set of 4 White Linen. Preppy Bar Car Decor. Hostess Gift. Cocktail Hour. 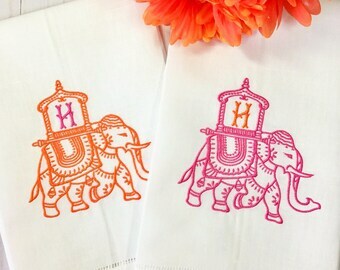 MONOGRAMMED Cocktail Napkins. Housewarming Hostess Gift. Personalized Bridal Shower Hostess Gifts. Chinoiserie MONOGRAM Cocktail Napkins. Personalized Wedding Gift. White Linen. Housewarming Hostess Gift. Monogram Pillow Cover made to fit a 12x16 Decorative Throw Pillow. Thin Vine Font. Baby Pillow. Wedding Gift. Graduation Gift. Mothers Day. Natural Linen Circle Monogram Pillow Cover made to fit a 12x16 Throw Pillow Insert. Farmhouse Decor. Wedding Gift. Dorm Decor.